Latest News : It’s time to say goodbye to the car and hello to the tram! Is your usual commute to Brisbane for work each day just a tad dull and boring? Why not let the tram and train do the driving, while you sit back relax and unwind or use this time to check emails or to post your next selfie? Just remember to tag us in your selfie #gclightrail #ridetheg 😊. 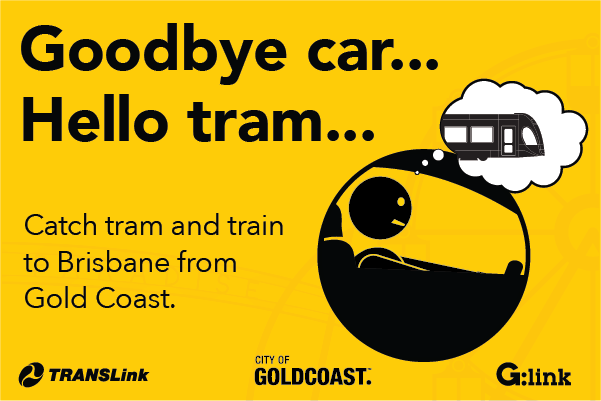 With the G: linking to train, it has never been easier to get from the Gold Coast to the heart of Brisbane City. Just get on a tram from any G:link station, and transfer onto a train at Helensvale station. One ticket, one transfer = one easy journey. G:link services run every 7.5 minutes from 7am to 7pm, Monday – Friday, and every 10 minutes on the weekends. You’ll never have long to wait for a service, which means instead of sitting in the car watching the road, you can chill with us while we take care of the driving. If you already have a go card, just remember to touch your go card to a card reader on the station platform at the beginning and end of each trip. You can also purchase a go card from the ticket machines on our platform (adult only available), Translink Kiosks, 7/11 stores and at attended Queensland Rail train stations. Other ticket options are also available, so make sure you check out your options here. For more information about ticketing, fares or to plan your journey please visit TransLink or call 13 12 30 anytime. To stay up-to-date on our services, download the My G: app, available on apple and android.